The estimated damage of the wildfires in North Carolina is predicted to exceed $55 million, as over 47,000 acres of land were burned. 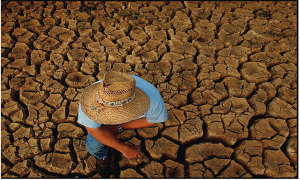 Drought threatens water availability, increases the risk of wildfires, and adversely impacts agriculture and ecosystems. The impacts from drought are based upon the duration and geographic coverage of precipitation deficits. In the Carolinas, drought is closely monitored by an active group of meteorologists, climatologists, hydrologists, and other physical scientists who meet to evaluate conditions and possible impacts. As temperatures continue to rise, the duration and frequency of drought is likely to increase, as more groundwater is evaporated into the atmosphere. In addition, longer periods with little to no precipitation are expected. In November 2016, a long-term drought across the Southeast U.S. contributed to the development of an exceptionally active wildfire season across the Carolinas and other portions of the region. The estimated damage of the wildfires in North Carolina is predicted to exceed $55 million, as over 47,000 acres of land were burned.